Garlic is one of the most widely used vegetables in the United States. Garlic's closest relative is the onion. In its dry or powdered form, garlic is used as a seasoning in everything from pickles and bread to soups and stews. Garlic has also been found to have great medicinal benefits as a heart-healthy food. 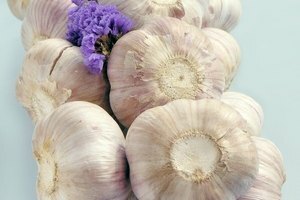 Numerous case studies have shown that garlic may reduce the risk of some cancers, though its exact effectiveness is unclear. 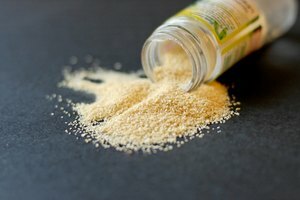 There is no real difference between granulated and garlic powder, except for the size and texture of the granules. The manufacture of both granulated and powdered garlic is the same, except for the grinding or powdering process. Granulated garlic is coarse while garlic powder is ground extra fine. Whole cloves of garlic are peeled, cleaned and then sent into a machine that slices and chops them into smaller sections. The sections are dried in slow ovens for three to four hours. When the garlic has cooled it is ground to the desired consistency, be it granulated or powdered. The finished products are put through sifters to separate any debris or undesirable pieces. Both are packaged in air-tight containers and stored in a cool, dry place. Both granulated and powdered garlic have the same nutritional value. Each variety will produce about the same intensity and flavor when added as seasoning to foods, though the measurements to equal one whole clove will differ slightly: One third of a teaspoon of granulated garlic equals one average-size clove, while it takes approximately half a teaspoon of powdered garlic to equal the same size clove. Granulated and powdered garlic are used to season and enhance the flavor of many foods. Often it is an appropriate substitute when fresh garlic is called for in a recipe. Powdered garlic dissolves almost instantly when incorporated into any dish, hot or cold. Granulated garlic takes a few minutes to become incorporated and release its flavor. 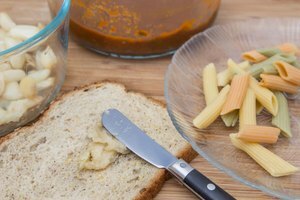 While any true Italian-cuisine aficionado may scoff at the thought of using granulated or powdered garlic, both will function in the same manner as fresh garlic in just about any Italian recipe. Powdered garlic can also be sprinkled on pizza, as a condiment, when the pizza is served. In fact, keeping some on the table along with the salt and pepper is a nice convenience for those who enjoy extra garlic flavor in their dishes. While garlic may have many health benefits, in powdered and granulated form those benefits are significantly reduced. If you are adding garlic to your diet for medicinal purposes, granulated or powdered garlic will not give you the results you are seeking. 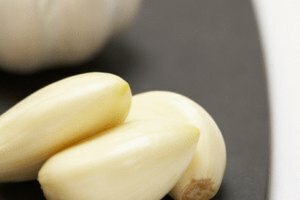 For health purposes, fresh or raw garlic is the best form to consume, though many do not like the side effect of garlic breath. In that case, you can take garlic supplements in pill form. Garlic powder or granules can be added to boiling water to make an antiseptic to treat wounds. 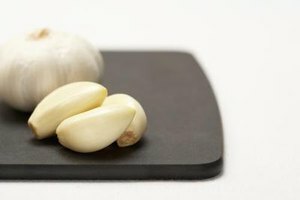 Enzymes in garlic help prevent infection. Simply add one tablespoon of granulated garlic or 2/3 tablespoon powdered garlic per cup of boiling water to dissolve; then let the solution cool. Apply to the wound with a cotton ball three times a day for one week, or until the wound has healed enough that infection is no longer a concern. Store the solution in a lidded container in the refrigerator. Healthline: What Are the Most Effective Natural Antibiotics?